Syrian rebels pose after seizing control of the Bab al-Hawa border post on the Syrian-Turkey border on July 20. Now, the rebels are facing a new challenge: radical Islamists, who they say do not represent them. Islamist fighters carry their flag during the funeral of a fellow fighter who died during clashes on Sunday, outside Aleppo in northern Syria. A similar flag, raised over the Bab al-Hawa border crossing, was at the heart of a dispute that highlights the growing tension between homegrown Syrian rebels and radical Islamists who have flowed into the country. Homegrown rebels have done most of the fighting against the Syrian government troops. But Islamist militants from abroad, including some with links to al-Qaida, are now joining the fight against the government in growing numbers. The local rebels are not pleased with this development, and there is growing tension between the groups that share a desire to oust President Bashar Assad but little else. Until a few weeks ago, the border crossing at Bab al-Hawa on Syria's northern frontier with Turkey was the site of a training camp for a militant Islamist group. But a rebel with knowledge of the operation to eliminate the al-Qaida-linked group says they are now gone — and he says it's for the good of Syria. Now, the black banner favored by Islamist militant groups has been replaced at the checkpoint with the flag of Syrian rebels. Syrians crossing the border into Turkey confirmed that just a few of the foreign fighters remain. "They are still there. We talked to them a little bit," says Abu Mahmoud, a Syrian activist, adding that the leader of the Islamist radicals was assassinated. That leader, Firas al-Abseh — also known as Abu Muhammad — was Syrian. But activist Abu Mahmoud says Abseh's fighters were radicals from abroad; there are reports of fighters from Libya, Tunisia, Saudi Arabia and Jordan. A rebel source says Abseh trained in an al-Qaida camp in Afghanistan in the 1980s, and that once he was killed, his unit was dispersed and paralyzed. This was believed to be the first direct confrontation between Syrian rebels and Islamist radicals. 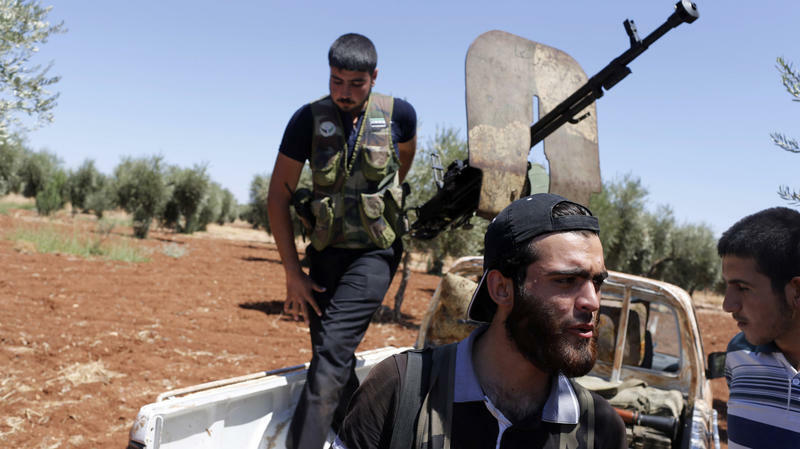 The Farouk brigade, the largest of the homegrown Syrian rebel groups, provoked the clash. The dispute started over a flag, says Adib Shishakli, a Syrian opposition politician. "They had a disagreement about what flag should be raised over Syria," he says — the flag of the Syrian rebels or the Islamists' black banner. The flag raised larger concerns, he says, that radicals are trying to hijack the revolution. "This is not a political playground for everybody to come with his own agenda and try to execute it," Shishakli says. The killing of an Islamist extremist by Syrian rebels is a sign of the internal dynamic of the fight to topple the regime — and the intense competition for guns and money. 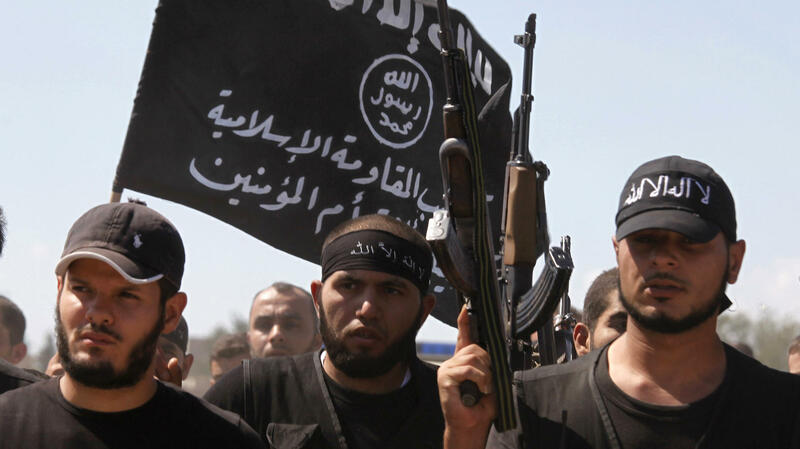 A new study by the London-based Quilliam Foundation, which tracks radical groups, reports that extremists make up less than 10 percent of Syria's rebels, but warns that their influence is increasing because they are better funded and armed. In a crowded apartment on the Turkish border, Syrian officers who defected recently say more extremists are joining the revolution. They complain, bitterly, that money is pouring in from private donors who support radical ideologies. Abu Mohammed, a military doctor, blames the West for failing to back Syria's moderate rebel battalions. "Because when I am desperate and I need weapons, guns, and I find those guys filled with those things, I will join them," he says. When asked whether this gives the revolution a bad name, he responds: "The Western world created al-Qaida in Syria by doing nothing." Western governments are debating how much support to give the rebels. Concern over extremists is one factor that has made them hesitant. Syrian rebels at the border say that Abseh, the extremist leader, had to go. Mahmoud Najar, a rebel fighter, says his death sent an important message. "Because he give a wrong picture about us. The real Islam is not like they understand it," he says of the radicals. We are not extremists here, says Najar, and these radicals are against us, too. "They do such wrong things to us. So, they must be captured, all of them," he says. The rebels at Bab al-Hawa eliminated one extremist group. But as the Syrian conflict grinds on, more are joining the fight. We begin this hour in Syria, where Islamist militants and groups with links to al-Qaida are playing a larger role in battles against Syrian troops. But there's also serious tension between these radicals who've joined the revolution and Syria's homegrown rebel fighters. The latest evidence of that tension, NPR's Deborah Amos reports, is the kidnapping and reported murder of the leaders of a militant brigade in northern Syria. DEBORAH AMOS, BYLINE: This border crossing, Bab Hawa, on Syria's northern frontier, was the site of a training camp for a militant Islamist group until a few weeks ago. They are gone, and it's for the good of Syria, said one rebel with knowledge of the operation to eliminate a group linked to al-Qaida. Now, at this checkpoint, the black banner of the brigade of the Islamic state has been replaced with the flag of Syria's revolution. Syrians crossing the border confirmed that just a few of the foreign fighters remain. ABU MAHMOUD: They are still there. We talked to them a little bit. The head of them, he was killed. He was assassinated. AMOS: Syrian activist Abu Mahmoud(ph) says the leader of the brigade, Muhammad al-Abseh(ph), was a Syrian, but his fighters were radicals from abroad. A rebel source says al-Abseh trained in an al-Qaida camp in Afghanistan in the 1980s. UNIDENTIFIED MAN #1: Once he's killed, then this unit of al-Qaida - this was strong unit - they were dispersed and paralyzed. AMOS: This was the first direct confrontation between Syrian rebels and Islamist radicals. The Farouk brigade provoked the fight, the largest of the homegrown rebel groups. The dispute started over a flag, the black banner of the brigade of the Islamic state, says Adib Shishakli(ph), a Syrian opposition politician. ADIB SHISHAKLI: This is a flag of an Islamic state or al-Qaida. AMOS: But the flag raised larger concerns, he says, that radicals are trying to hijack the revolt. SHISHAKLI: This is not a political playground for everybody to come with his own agenda and try to execute it. AMOS: The death of an extremist is a sign of the internal dynamics of the fight to topple the regime and the intense competition for guns and money to continue the fight. A new study by the London-based Quilliam Foundation that tracks radical groups reports extremists make up less than 10 percent of Syria's rebels, but warns their influence is growing because they're better funded and armed. In a crowded apartment on the Turkish border, these Syrian officers, recent defectors, say more extremists are joining the revolt. They complain bitterly that money is pouring in from private donors who support radical ideologies. Abu Mohammed(ph), a military doctor, blames the West for failing to back Syria's moderate rebel groups. ABU MOHAMMED: (Through translator) When I am desperate and I need weapons, guns, and I find those guys full with those things, I will join them. AMOS: Do you think it gives the revolution a bad name? MOHAMMED: (Through translator) The Western world create al-Qaida in Syria because of doing nothing. AMOS: Western governments are debating how much support to give the rebels. Concern over extremists has stalled a definitive answer. UNIDENTIFIED MAN #2: We lost our guy. AMOS: Here at the border, rebels say that al-Abseh, the extremist leader, had to go. Mahmoud Najar(ph), a rebel fighter, who says he learned his English from watching American movies, says it sends a good message now that al-Abseh is dead. MAHMOUD NAJAR: Because he give a wrong picture about us. The real Islam is not like they understand it. AMOS: We're not extremists here, says Najar. And those radicals, they're against us too. NAJAR: They do so wrong things to us. So they must be captured, all of them. AMOS: The rebels here at Bab Hawa eliminated one extremist group. But as this conflict grinds on, more are joining the fight. Deborah Amos, NPR News, Antakya. Transcript provided by NPR, Copyright NPR. On a recent day in the northern Syrian town of Azaz, there's an edgy energy when a pickup truck armed with a heavy machine gun screeches to a halt. Wild-eyed and high-flving, the young rebels in the truck are happy to be alive after they hit a government helicopter landing at an air base 8 miles outside Azaz. This rebel-held town is under nightly attack. This lightly armed rebel crew races out to the air base every day to target regime aircraft from hidden sites in the olive groves. A Syrian documentary film producer whose disappearance two weeks ago prompted concerns for his safety and a letter of support from the Toronto International Film Festival is now free, according to reports. The conflict in Syria is sending a staggering number of refugees into neighboring countries. Turkey, Jordan and even Iraq are building tent cities. But Lebanon has yet to build such camps. 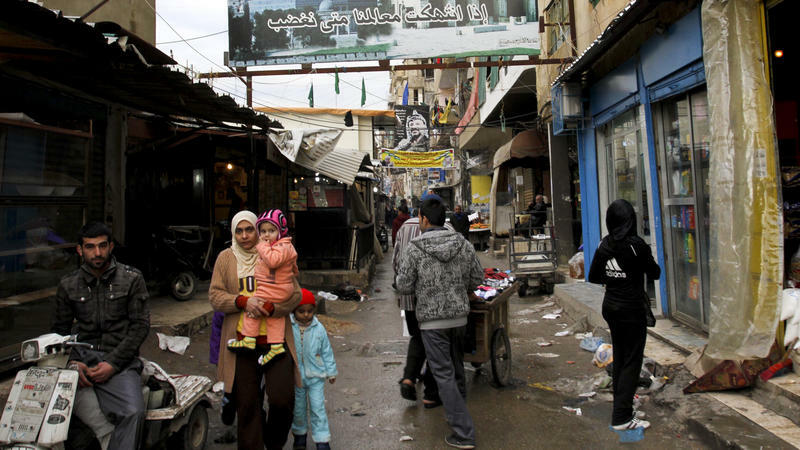 The country is already home to more than a dozen teeming, squalid camps for hundreds of thousands of Palestinian refugees who fled the war after Israel's creation in 1948, as well as their descendants.